Battery powered version of the Atrix VACBP1. All the benefits of the VACBP1, with complete cordless freedom. Backpack vacuums are ideal for situations that require greater mobility, large distances or varying heights. With no cords, traversing multiple floors is a seamless process and not being tied to a wall frees you to concentrate on getting the job done. With a 3 quart reservoir, the VACPB36V has a 4 stage filter system and HEPA filtration bags. Reversible flow allows you to convert from vacuum to blower, increasing your debris removable capabilities. Includes hose, adjustable extension wand, 1.5 foot power cord, hard floor tool, PT160 turbo brush for low pile carpet, Wessel Werk turbo brush, oval brush, furniture brush, hose and filter plugs, ATI34663 adapter, 31657 goose neck handle, 36V battery and charger. 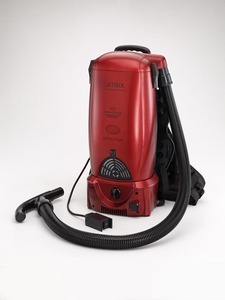 Atrix Battery Backpack is perfect for cleaning confined areas and where corded electric vacuums are not a viable option. The battery feature eliminates all safety hazards that corded equipment may cause. Users are granted the freedom to clean anywhere such as on scaffolding, entry ways, attics, or in stairwells. 36V cordless backpack vacuum with rechargeable battery & charger, 55 minute continuous run time and quick 2.5 hour charger. Features a convenient on/off switch which allows users to power down between work stations and extend battery life. Converts from Vacuum to Blower, Air Powered Turbo Brush, Telescopic Metal Wand, HEPA Filtration, Crevice Tool, Floor Tool, Extension wand, Blower Nozzles, Round Brush.